Being able to search through the files you have on your computer is an integral part of file management and typing a search term into a box and letting the computer do it will save far more time than manually searching through drives and folders yourself. Windows has had the simple ability to search for a file for the longest time, and in Windows Vista an even faster way was introduced to search your files with the indexing feature which brings up the search results almost instantly. Search indexing is a simple concept and it collects the names and locations of all the files you have on the computer, and places them all into a database. When you search for something the database is queried instead of Windows manually going through the whole system to see if a file match exists. Before you can make use of indexing in Windows the system first has to create the database. 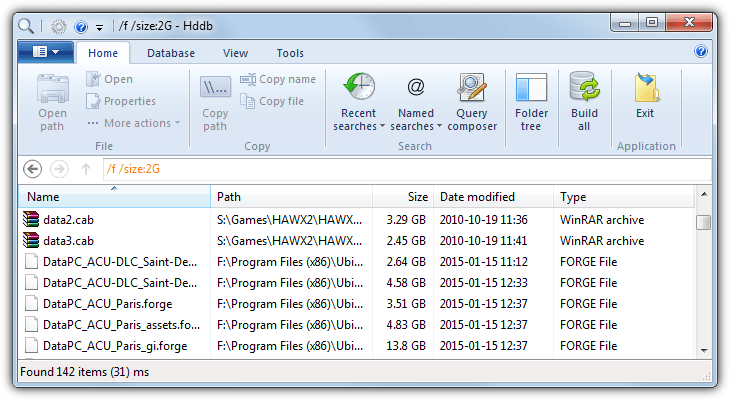 Windows Search is often criticized because it can be resource intensive and make thousands of writes to your hard drive or SSD in the background. While Windows Search might not be the best, if you have hundreds of thousand or even millions of files stored on your system, indexing is still the way to go for the fastest results. 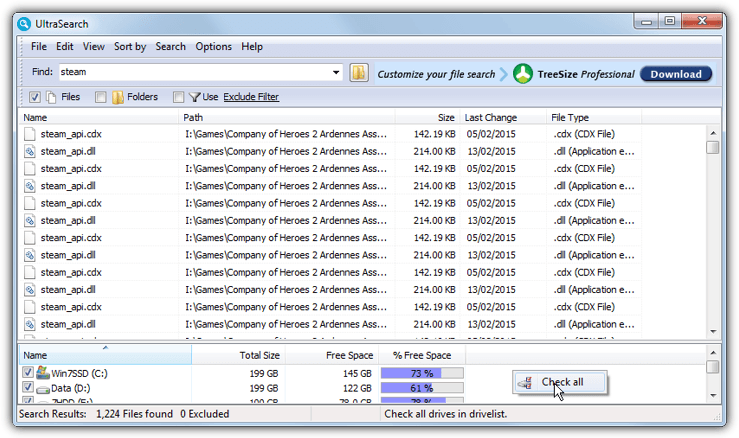 Windows Search isn’t the only indexing search tool available, and there are many others that can index your files quickly by reading the Master File Table on the drive, here are 7 for you to try out. A lot of people have recommended Locate32 to us over the years as a good quality and fast file searcher that uses an index database to get faster results. While the version on the official website is from 2011, there is a repository at Sourceforge and a newer version from 2014 with a few updates and fixes is available. Although creating a database is done manually, there are quite a few options for setting one up, including the ability to have multiple databases and perform searches from specific databases. Locate32 supports searching with wildcards and regular expressions with additional tabs to filter results by date, time and file size. The Advanced tab offers other search filters like casing, extensions and files or folders only, the “File containing text” option will search the contents of files for the search string although this will significantly increase search times. One thing we noticed while using Locate32 is there was sometimes a several second hang on startup and also at certain times inside the program when altering configuration or search options. While not a major annoyance this could become a problem on less powerful computers or when dealing with huge databases. That said, Locate32 has plenty of functions to tailor searching to your liking and is still a useful tool, it’s also portable. TheSearchMan is by the same developer as TheFolderSpy and his tools are usually small and compact. What makes TheSearchMan a useful alternative to some other similar tools is it’s database is only manually created when you tell it to, and it’s a very simple portable tool to work with offering no configuration options at all. On first run simply click “Create new index” to index all files on your drives, after that the Index Search option becomes available. Then type in your search term, wildcards are accepted. “Search within results” will open another window to narrow down the results you have even further, while normal search will perform a non indexed slower search on the drive (use ‘all’ for all drives) or folder you enter. TheSearchMan is from 2011 and despite the occasional crash, it’s an effective and very simple file finder, make sure to use the correct 32-bit or 64-bit version. For an indexing search program, Everything is the most well known. It has a lot of useful options while still being easy enough to use unless you are a complete novice, although to get the best out of it some knowledge of inputting commands is beneficial. Everything indexes your NTFS drives on first run and then watches the filesystem for changes, updating the database as necessary. 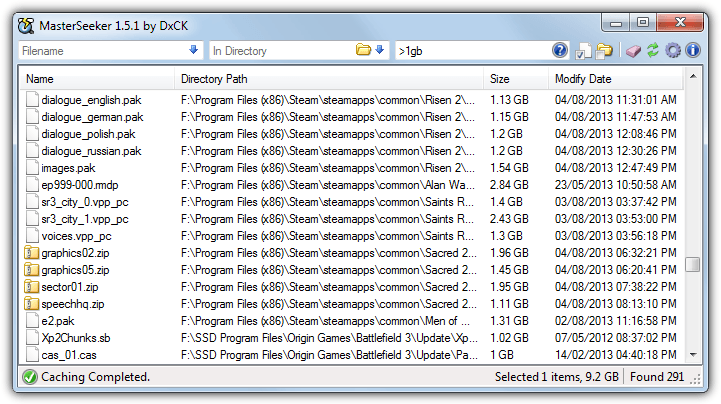 Other drives such as CD/DVD ROM, NAS, (ex)FAT(32) and Windows shares can be added manually and updated periodically. You can search using boolean, regex, wildcards, file types, macros and the built in syntax. Other notable features include HTTP/ETP/FTP server options, bookmarks and comprehensive command line options. Both portable and installer versions are available. A couple of minor niggles we came across were it seemed to want to reindex some drives on almost every startup, even if the program has only just been closed, and when filtering the whole file list with a date and/or size, querying for the results can take a while. This first issue should be fixable by altering USN Journal size or disabling the option to monitor changes. The second issue is known about and should be updated in the next version of Everything. We’re not quite sure what has happened to Hddb because it appeared in early 2014 and showed a great deal of promise, then less than a year later the website was gone and there has been no news or updates since early 2015. A great shame for a tool that was becoming one of the best indexing file searchers around, hopefully it will continue at some point in the future. Hddb is quite flexible with indexing, by default it asks on first run to create a database and then you create subsequent updates manually. Alternatively there are options to also create on program startup or a user defined amount of minutes/hours/days. Even with over 2 million files in the database, searching for results is incredibly fast and measured in milliseconds by the program. The Query Composer can quickly allow you to use more advanced filters and search by files or folders, file size, modified date and time, and drive online/offline status. One advantage Hddb has over Everything is the near instantaneous display in the search results when filtering by size and date. Everything can take several seconds to do the same thing on a large file database. Other useful functions are export to text file, a file preview window, a file hasher and a web server option to access Hddb from the network or internet. Installer and portable versions are available. Although MasterSeeker indexes the drives on every startup like a number of other programs, what makes this program stand out is the sheer speed at which it creates the database, around 7 seconds on our test PC with 2 million files. This does come at a price though because with that speed also comes a sizeable memory footprint and the MasterSeeker.exe was using 400MB-700MB of system memory after creating our index. If you have a lot of files to index and the memory to handle it, MasterSeeker is a very fast tool and one of the quickest we tried. The real-time results are fast to show when you start typing a search term, filtering by file size is also near instant, and clicking on a column to sort the list works at a good speed, even with millions of files displayed. Sorting by directory and filtering out files or folders is an available option. Wildcard and regular expression searching is supported, as are NTFS, FAT, FAT32 and exFAT file systems. MasterSeeker is portable and requires .NET Framework v2.0. 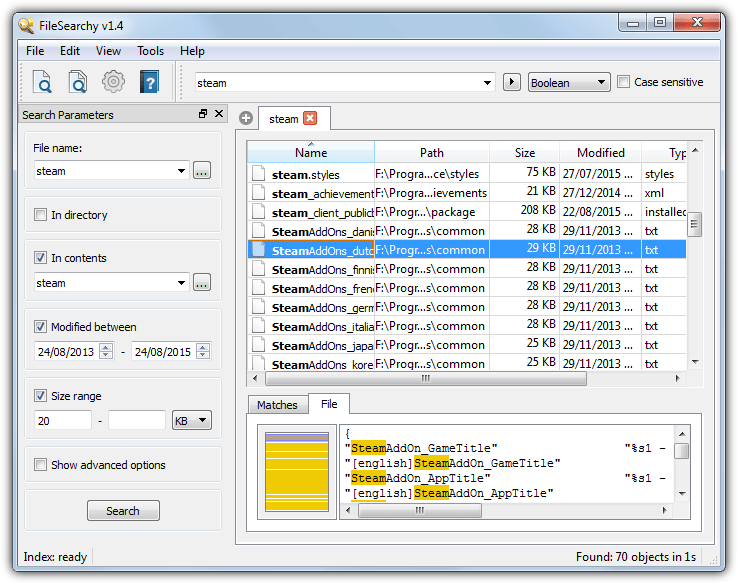 UltraSearch is by Jam Software, the same developer behind the popular TreeSize program. This is another one that indexes drives on the program’s launch but it was reasonably fast and indexed our 2 million files in about 15 seconds. This number could change dramatically if you have slow hardware and/or several million files. To start it will only index the C drive so you need to right click in the drives pane at the bottom and select more manually or right click and “Check all”. While you can use wildcards and regular expressions to help filter the search results, other options like filtering by file size and dates are not available, however there is an exclude filter and you can also turn on or off the option to show just files, just folders, or both. To search a single drive or folder simply use the browse button or enter the path into the search box. Both installer and portable versions are available. What makes FileSearchy a useful addition to your collection is if you want the speed of indexing and the ability of searching for text strings inside files. FileSearchy is quite smart because it ignores any binary files and only searches through text files, Office documents, PDFs, html files etc. The list of searchable file filters can be edited from the options window. FileSearchy indexes NTFS drives on first run, which can take a minute, then the database will update a drive’s entries on subsequent starts if the file table has changed. Searching by substring, whole word, regex or boolean is accepted and with the Search Parameters open on the left you can also search by specific folders and filter results by date and file size. Substring, whole word, regex and case can also be used when searching inside file contents by enabling Advanced options. By default FileSearchy runs in the background, to turn this off go to Options > General. FileSearchy is also tabbed meaning you can have several different search results open at once. Final Note: There are other programs available that use indexing for searching which we don’t have in our list, and are worth checking out if the tools above don’t do exactly what you want. They include Wise JetSearch, NTFS Search, SwiftSearch, and Index Your Files. Has anyone ever thought about writing an index-based software with content duplicate search function? The calculation of the hash necessary to determine if a file is identical to another is very long, but if all hashes were kept in a database and only the hashes of new added files were calculated, the search would be immediate. My no.2 search tool, which searches inside files is Lookeen Free. copernic will do exactly that .. search inside emails, pdf, excel, txt, etc etc etc and index the search .. i’ve used this app for about 10 years now and even upgraded from their free to paid version … well worth the $20 … now i dont have to remember where i stored or what the name is .. as long as i remember some of the word content .. voila..
“Locate32” is another tool if you want to search any kind of files and folders (Doc,mp3, Psd etc) including .dlls and .exes. I came across a great software a while ago that serves the same purpose(or may be even more). It’s called “Locate32”. I HIGHLY recommend it! It has shell integration too, you can configure it from the general tab when you go to options. You can also configure it to run from a hotkey. I use Ctrl + Alt + Shift + F to make sure it will not conlict with any windows shortcut. It would be awesome if you could find a way to re-route windows search hotkey key to run Everything! @Gregg interesting what you say about Locate32. I don’t find it does any background scans at all. You need to update the database once before you use it, if you want the very very latest updates (which is not usually the case – as its an old file that you cannot find), and that takes about 3 minutes for me, over my 1.5TB of data. After that its done and i can search anything I want to. Could you expand by what you mean when you say background resources being used up? I am guessing you are referring to the scheduled updating of databases, but I have that disabled other than when I manually initiate it. To me those few minutes is well worth the search inside documents feature. I guess a lot depends on how you use the search function and what you use it for. Hi Raymond, I use Search Everything since several years. Thank you Raymond – useful advice. 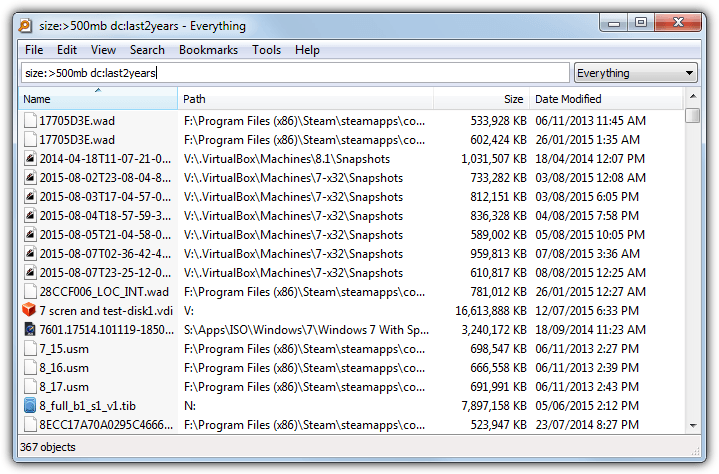 The “Everything” search engine uses the NTFS disk system’s tables… its own method of keeping track of files. Once Everything initially reads those tables, and builds its database from them (which takes, literally, only seconds, even for very full multiple hard drives), then it’s ready to go. As a file’s name, size, location, etc., changes, Everything’s database is also updated. Instantly. There is, then, no background scanning. One of Everything’s most salient features — the reason why it’s so superior to ANY other file/folder search tool — is because it’s so resource economical. The “Everything” search tool completely eliminates the need for ALL other file/folder search tools. And I mean ALL of them. Even Locate32, mentioned here and in the previous article by so many, does background searching/indexing, and so, therefore, uses infinitely more resources (and is slower) than the “Everything” search engine. And please bear in mind that I quite like Locate32, generally speaking. However — and I mentioned this in comment to yesterday’s article — Everything does not search for text within files; and I’ve communicated with Everything’s author who said that if he added that feature to Everything, it would be no faster than something like Agent Ransack or File Locator Pro. And the reason is because in order to find text within files, the search tool must actually find, open, scan/read, and then close every file it searches. There is a finite limit to how fast any software can do that. Remember that when “Everything” builds its database, and keeps it up to date, it’s just mirroring the NTFS system’s own internal tables. So “Everything” is doing no whole-disk scanning. That’s why it’s so fast. But if it also searched for text in files, then all bets would be off, and “Everything” would be no faster — at least during searches for text within files — than any other search tool which can search for text within files. What makes both Agent Ransack (and its commercial big brother File Locator Pro) so remarkable is that its(their) author has made his search tools just about as fast at the task of searching for text strings within files as anything out there. However, he does not incorporate the “Everything” method for just plain file search; and both his text-within-a-file searches, and his just plain file searches, both scan the drive, file-by-file. Granted, his utilities do it about as fast as any — faster than most, in fact — but it’s still file-by-file. That’s why, as I meant to convey (but probably should have been more direct about it) in my posting yesterday that in order to have the absolutely best combination of file tools on one’s machine, one needs to have BOTH the “Everything” search engine (strictly for file and folder searches), and also the “Agent Ransack” (if you want the freeware version), or the “File Locator Pro” (if you want the commercial version) utilities on one’s machine. One needs BOTH of them: One to search just for files/folders, and the other to search for text within files. 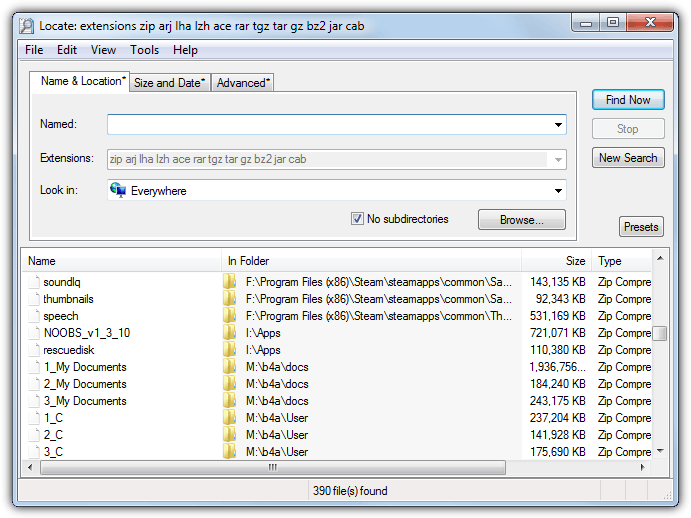 If one uses the “Everything” and “Agent Ransack” (or “File Locator Pro”) combination, one has all the file searching capability that one needs. …but not better or faster than the killer “Everything” and “Agent Ransack” combination, wherein one uses “Everything” for file/folder searches, and “Agent Ransack” for searching for text within files. And one of the salient reasons why is because unlike as happens with Locate32, or Windows’s built-in search, or Copernic, or Google’s Desktop search, neither “Everything” nor “Agent Ransack” are sitting in the background, scanning and indexing whenever the system is either idle or experiencing low usage. …and it especially appeals to people experienced with older versions of Windows because its interface is so much like the way Windows’s native search used to be back in NT (actually, Win2K) and older versions. Locate32, along with “Agent Ransack,” also has that sort of older Windows native search interface, and so appeals to old-timers like me. Other credible free ones include “File Seek” (and also “File Seeker”), XSearch, Ultra File Search, Insight Desktop Search, Find Any File, and others… SEVERAL others, in fact. If one insists on using the kind of search tool that builds a database from its own scans, and more or less constantly scans and indexes (like Windows native search does, or like Google Desktop Search does, or like Copernic does), then I have to recommend Locate32. The average non-technical end-user might be a tiny bit confused by getting it installed and working properly, but it’s a fine, fine program of its type. Probably best-of-breed, all things considered. But, trust me, all things considered, nothing — and I mean NOTHING — can ultimately beat the little, killer, freeware combination of “Everything” and “Agent Ransack” (or, if one’s willing to pay for a commercial product, then “File Locator Pro” instead of “Agent Ransack”). And, no, by the way, I have NOTHING to do with any of these products (in other words, I’m not their author, and I don’t work for their authors). I’m just a tech consultant in his 50s who’s been doing this kind of work for pushing 35 years (and who bothers to keep-up with his craft as if he were a teenager, despite his age), and so who kinda’ knows what he’s talking about. I’m new to your blog. I love the way you write articles and select topics to write. Even better thing is how you are monetizing this site .. Hats Off and Keep Going..
yeah, everything is a great prog. but i have deactivated the continous background indexing, because i hate it, when my harddrive goes “zip zip zip” all the time (im confident with the opinion that this will sometime kill my hdd ^^). (its a option in the options menu, i think). Very interesting, I’m going to give it a try. Currently using locate32. It’s free as well. Will try everything as well.. Sounds like a great app. I currently use Google desktop which works fine for me. They sound quite similar.